Literally, it seems you can forget rain. In southern Indiana in August, the world just seems to dry up. Last fall was the worst, with a drought that lasted well into September and October. This year, August was dry enough to finally do in the impatiens I’d been keeping alive for most of the summer with minimal watering on my part. And to make it unlikely that the late tomatoes would do much of anything. I’m not comparing August in Southern Indiana to the desert in Arizona or anything, but after a while, you begin to forget about rain. And I love rain. I don’t think I could live in a place where you had to go much longer without rain than we do here in August. And this week, it’s been raining again. Rain might be my absolute favorite kind of weather. I can’t remember ever saying, “I wish it would stop raining.” Okay, maybe when I’ve been driving somewhere in a torrential downpour. I love the sound of rain. The sound if makes falling on the roof. In my old house, the sound of the water draining down the gutters outside the kitchen window. The sound of car tires going by on the wet road outside. The way bird song sounds filtered through rain, muted and like you can just imagine the birds all feathered and tucked away warm and dry in some tree, watching through the leaves. I love a heavy downpour, which sounds like the beginning trumpets of an invasion, all adrenaline and drums. I love the sound of light drizzle, airy and sweet like wrapping paper being crumpled up. I love the sound of rain falling on a beach, something surprisingly sharp in the way the water hits the soft surface of the sand. I love the way rain looks. Yesterday from my office window, it was the lightest little sprinkling, shiny drops that almost looked like snow from inside. Or the harsh lines of a hard rain, all straights or diagonals, etching the view of the world like those drawings you used to make when you were little, layering black crayon over colors and then dragging a sharp point through to reveal the scene underneath. I love the look of rain blowing in a strong wind, like Mother Nature is a fast and furious pitcher on her mound, throwing wave after wave of water at us cowering here on home plate. I love the mist that forms after a rain in all the valleys around here, making the whole world feel primeval and mysterious. When I was young, I loved the way rain looked from underneath the surface of our backyard pool. With the goggles on, you could dive under and watch the rain as it fell on the pool, the ripple seen backwards, from below. Floating under the water, looking up at the rain as it fell, it was as if you were privy to a glance behind the scenes of the world. 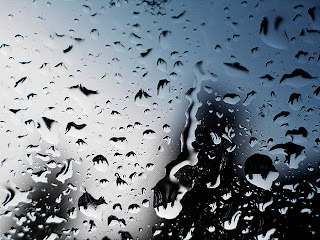 I love to watch raindrops falling on a car window, the way they join together as they wiggle across the surface of the glass, changing direction in pursuit of the next drop to absorb. 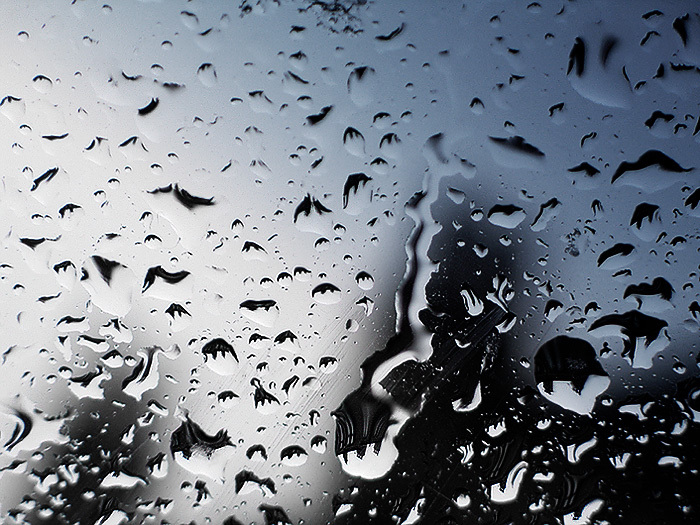 It’s hard to believe that the drops of water aren’t living creatures as you watch them work their way across the window. I love the gloomy light of a rainy day, the way the world looks without the bright light of the sun. The sense that the whole planet has become a dark, cozy space in which you could curl up. Of course, I love the way rain feels. I love a cold rain, which gives beauty and magic to warm sweaters and cups of hot tea. I love a hot rain, which falls like the blessing of free air conditioning. Maybe most of all, I love the way rain smells. My husband doesn’t always believe me when I tell him you can smell rain coming sometimes. And I don’t know if he can smell it after it’s come. What does rain smell like? Rain. Nothing like the canned air fresheners that claim to smell like rain. There is something in the smell of lavender that makes me think of rain. And mushrooms. But rain itself smells like neither. How can rain smell like anything when it’s just water falling? And yet it does. Perhaps it smells of mixing, the release of soil and asphalt that comes when the water hits them. Perhaps it smells of relief, the pure joy of life falling from the sky. There is something of dirt in the smell of rain, but so much more than just that. It smells like comfort to me. Like a reminder of something important. Like a gentle but insistent whisper. Whispering that it may be dry for long periods of time, but then eventually, it will rain again. Whispering that things will start and things will end, and that it’s all okay. If you like You Think Too Much, like it on Facebook, here.